On the next site, facing both Science Road and, around the corner, the path to the Footbridge (Barton Bridge), there was by1882 a small cottage and associated buildings that were used as the first medical school in 1883-5 and a hut that housed the men’s union. Medicine moved on to grander things and in 1893 the Government Architect prepared plans for a School of Mines on the site. This was opened at the beginning of 1895. The original School of Mines building was designed by the first professor of Geology, Sir Tannatt William Edgeworth David (28 January 1858 – 28 August 1934), a remarkable geologist of Welsh Australian origins. Much revered in his lifetime, he led the first expedition to reach the South Magnetic Pole. He also served with distinction in World War I. The present rendered brick irregular side facing the footpath to the bridge is the effective main entrance to a building that has undergone extensive internal and external alterations. 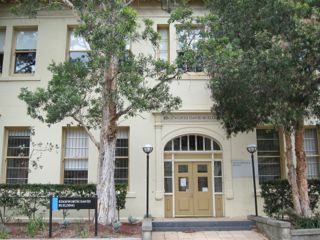 Of stuccoed brick and unornamented design, the building successively provided accommodation for geology, mining and mineralogy until 1962 when it was taken over by biological sciences. The original large lecture theatre with a seating capacity of 250 has been upgraded. Professor Leslie Wilkinson altered the external appearance to fit his vision of an integrated Science Road.